I don't think I ever mentioned where we'd like to spend our honeymoon, so here is a whole post dedicated exclusively to our honeymoon plans! I didn't really know what to talk about today and I asked you guys on my instagram what you'd like me to write, and I got a nice comment suggesting honeymoon, so here it is. Now, before I tell you about what we have in mind, let's talk about honeymoon per se. I think honeymoon is not what it used to be some years ago, for my parents generation, let's say. Why do I think this? Well, I don't know about your parents, but mine had never really traveled together until their honeymoon, so it was a HUGE thing. Jeff and I, as most of the couples our age, have traveled together many many times and to gorgeous places that could perfectly be a honeymoon destination, like our trip to Thailand some months ago. Because of this reason, I think planning the honeymoon is now more difficult than it has never been, and this trend has obviously just begun. People travel more and to more remote locations, making it difficult to choose a honeymoon trip, which is supposed to be the grandest and bestest trip of your life! With this scenario I personally could only think of two kind of trips that fulfilled the grandeur requirements: 1. A round-the-world tour 2. A water villa in Maldives / Seychelles / French Polynesia, etc. The timing of our honeymoon is going to be a bit special because it won't be right after our wedding, and this for several reasons. First of all, as I mentioned several times, we're getting married in Catalonia on the 6th of October, but we're having a wedding reception in Hong Kong on the 29th of December, and it seemed just wrong to go on honeymoon before celebrating with our Hong Kong family and friends. Right after our Hong Kong wedding, we'll be going on a Thailand trip for 10 days with my parents, brother and uncles who will be in Hong Kong for the reception. At the end of January is already Chinese New Year, which we have to spend with our family, and this year so even more given that it will be our first year as a married couple. So... all this brings us to mid-February... which is why optimally we'll be going on our honeymoon at the end of February or beginning of March! :) That's 5 months after our October wedding, but it really seems like the best time, so I don't mind waiting! We'll have plenty of things to do in between. 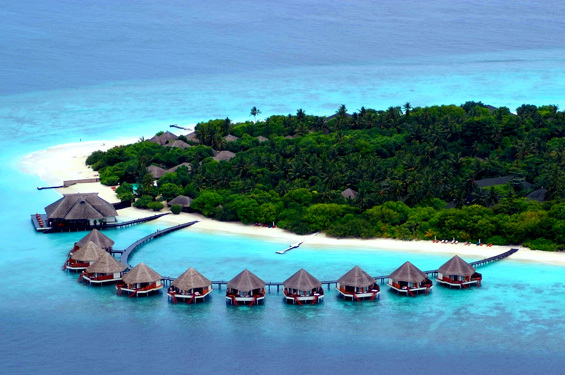 Besides, weather-wise it turns out February and March are the best months to travel to Maldives, woohoo! I'd really like to know your opinion on honeymoon nowadays. Do you believe, as I do, that it's becoming increasingly difficult to find the perfect destination? In my opinion - that I think applies just to our social-economic context- nowadays honeymoon is not that about destination per se but about how you live it. I'll explain myself. It's true that our generation has already been in lots of exotic and different places, for instance: when travelling with my boyfriend I've been asked many times if I was on my honeymoon. What comes to my mind when I'm asked so, it's something like "If I were, I wouldnt be in this hotel, I would stay in a breathless one in the best spot ever!". So, what am I expecting of my honeymoon? To travel to spectacular places of course, (not only one, I would do a combo of city sightseeing + beach), but also to be in stunning hotels and being kind of reckless about money, spend what I feel like to, enjoy every bit of it, feel like I'm in paradise. At the end, I guess what I'm trying to say is that honeymoon is more about the experience you live rather than the destination, which can totally play his part at strengthening the experience.